forum.419eater.com :: View topic - New Charity Scammer - Melon Heads Rock Out! New Charity Scammer - Melon Heads Rock Out! Weeeeee.... How much fun can a lad have? A new charity scammer has decided to contact me for help. Being the totally wonderful and generous person I am, I accepted. This scammer has a flair for the creative and for the theatrical. I do love a compliant lad who has a sense of adventure. Here are some of his emails. Apparently if I don't send him money then some children will die. Makes my blood boil. He's also using a real charity. Excellent! 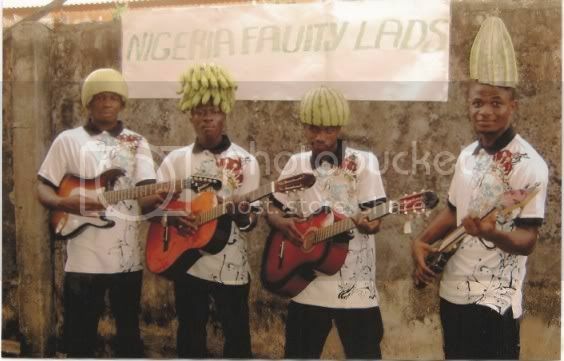 I sent him this picture and told him to emulate my new band. He's very creative and decided to impress me with this amazing effort. Of course, everything was wrong. I did love his effort to impress me. So he had to do it again. Next month, hopefully we can do something more interesting. Where's my popcorn? This should get interesting. You always impress me with how you are always able to get just what you want from your lads. Love the pictures and it's wonderful seeing them look like fools. I will enjoy watching you cause them lad pain. What a healthy band of mariachis! Eat fresh fruit ! Those lazy fuckers forgot to paint a backdrop. If I were you, I'd be very mad. 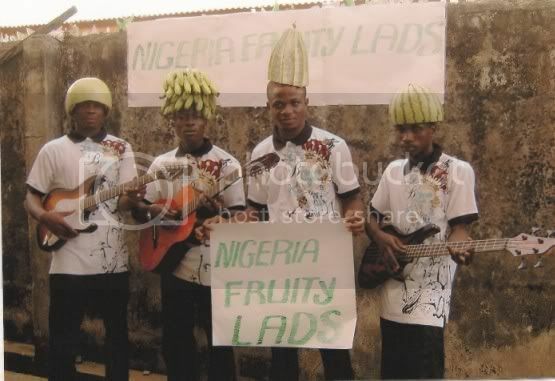 Its easy to put some pieces of fruit on your head, but thats not what they're being paid for. They have GOT to redo those pictures with a painted backdrop. err, no, a painted back-drop is not appropriate at all - they should have an enormous pile of giant fruit. Or perhaps a painted backdrop AND a giant pile of fruit. Looking forward to see how this one develops. Very good, the water Mellon hats made me giggle out loud at work. NN yet again you have caused me almost as much pain as you caused the lads!!!!!!!!!! This guy is quite intelligent. His sentence structure, punctuation and grammar is above the norm. He also adapts to my script very quickly and is keen to collect. When I'm contacted by a charity-like email I always shoot an email to the real charity and ask them if they know this person (I attach the ID sent to me) and the contents of the email. Just to be sure... Now this particular charity is keen to see these people prosecuted, which we all know is hard to do. I explained to them the particulars of being unable to catch these scammers as their location is always fake and getting them requires some effort. Here is the latest round of emails. They are theatrical, and great to read. He has some fantastic one-liners. Once again many thanks for your mail which I received this morning. We will comply to your request of providing the required marketing materials soonest. It is really going to be fun with your good and professional ideas. We will come up with our own fruity ideas that will fascinate you and also give the event a beautiful colour with great fun to all and sundry in attendance. I have directed my foundation coordinator at our head office in Nigeria to put the marketing materials together in a special way to make your event a splendid one. Within few days from now,you are going to receive the wonderful package. It is a promise our foundation will like to keep. Thanks for your dedicated work to humanity which will make the world move like a love train full of smiling people. At some point he told me that if I can't send the money before the weekend that one several children will most likely die. What a prick. Imagine telling a real person this type of thing. They would send any amount so they didn't that on their conscience. We will be very glad if you will approve this one and important request from us because now a dime means a lot to us to be used in saving lives as seven children are in critical condition and must be flown abroad within few days from now. I spell the facts out for him. As for supplying you such a vast sum of money before our agreed date, we cannot be responsible for the lives of children already sick. If we had never come along they may never been saved. You would have already organised something correct? Otherwise that would be a violation of the Geneva convention and not in keeping with a doctors Hippocratic oath. You told me you have a weekly cost of over $58,000 - Which means you must have enough to keep operating for several months. I can request a taxable expenditure from your London office if you like? We have people there that could visit them for this information. Amazingly he doesn't want me to have someone visit his charity office. So he decides it's easier to just do as he's told. I hope they will really add more great fun and color to the events of the day. Our group( FOUR OF OUR STAFF) which form THE N1G3RIA FRU1TY [email protected] are really set to thrill any crowd. I have promised him a monthly payment and donation to his chosen account, which has been reported, and hopefully I can get more accounts. The bank account he's given me won't work, and once again I will be making the payment to the real charity. I have a feeling this lad will be quite miffed by that. The banana hat is very becoming. I wonder if they could be required to wear their new headgear everywhere they go for a week or so? That would be sufficient time for the fruit to ripen in the tropical sun. Fruity lads, melon heads. Nice work NN. More innocent fruit murdered by a NN lad. Oh, the humanity! Oh dear he's not pleased. Now let me set the scene. For this exercise let's call this lad Mr. Happy. Mr. Happy is a scammer who thinks he is so clever that he will have many a maga falling for his format. Mr. Happy thinks he has hit the gold mine of all maga. Me. The day before, Mr. Happy asked a few of his friends help him out with a simple picture request. 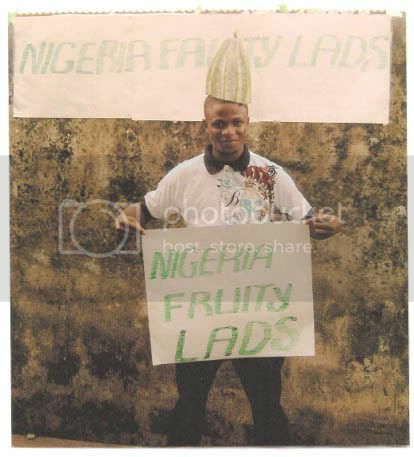 His friends are not happy about having to pose for the camera wearing large fruit on their heads, so he offers them some compensation, all because of this rich silly mugu who thinks he is a real charity. So he promises his mates some quick cash for this simple request. was unable to process a transfer through our encrypted banking procedure. efforts and we will pay as soon as we receive all the material. I am pretty sure at this moment his bladder exploded and he started doing this. changing so many things including our accounts. account did not accept your encrypted process. a decision that concerned us most. Ungrateful sod. Let me ask you. If you had employee that was stealing wouldn't you have changed all your accounts and passwords the moment they were busted? a normal process and didn't think it made a difference. legitimate means. We thought you would be happy for us making the effort. to your manager and they will confirm everything. He must be crying like a little girl... just like I was crying the last few minutes, but then in a sad way..